The recipe for the Hollywood Cocktail is an interesting mix of fruit flavours that one may not think of at first as a possible combination. Realistically, the dark black raspberry and light strawberry/pineapple work well together in a sort of yin and yang relationship. 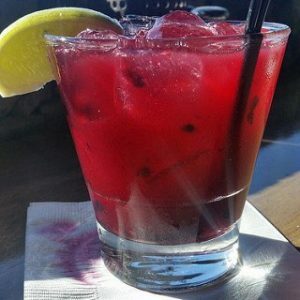 The Hollywood (sometimes called a Raspberry Smash) is a rather popular juice drink, and one that bartenders should know. If you prefer, the Hollywood Martini is a neat version of this rocks juice recipe. Fill collins glass with ice. Add vodka and liqueur to cocktail shaker with 1 ice cube and shake 5-6 count. For more on our vodka based cocktails, check out all the related drinks with a quick search.